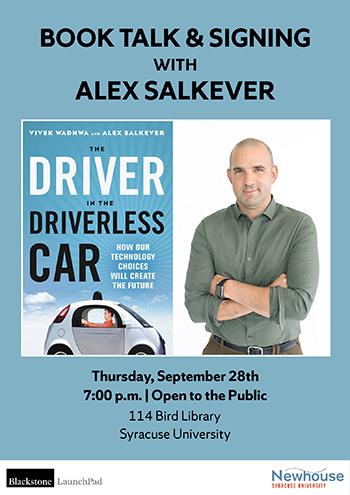 Experienced marketing executive, futurist and award-winning author Alex Salkever will speak about his new book, “Driver in the Driverless Car,” on Thursday, Sept. 28, at 7 p.m. in the Peter Graham Scholarly Commons, 114 Bird Library. The event is co-sponsored by the Newhouse School and the Blackstone LaunchPad. Vice president of marketing communications at Mozilla, Salkever drives strategic positioning and marketing communications campaigns, overseeing global communications, social media, user support and content marketing teams for Mozilla and Firefox products. His new book inspires readers to evaluate the potential impact of any new technology by asking simple questions about what technology means and how we allow it to move forward. As computers beat the reigning human champion of Go, a game harder than chess, and create life forms from synthetic DNA, what does this mean for humans? Breakthroughs such as personalized genomics, self-driving vehicles, drones and artificial intelligence promise a future world, but do they also raise issues of a jobless economy, complete loss of privacy, and ever-worsening economic inequality? As the authors put it, “Will our future be Star Trek or Mad Max?” The decision is ours. Salkever and his co-author Vivek Wadhwa ask three questions about emerging technology: Does it have the potential to benefit everyone equally? What are its risks and rewards? And does it promote autonomy or dependence? Their treatise is that the future is up to us to create—that even if our hands are not on the wheel, humans must decide the driverless car’s destination. Before joining Mozilla, Salkever was chief marketing officer of Silk.co, a data publishing and visualization startup, where he led efforts focused on user growth and platform partnerships, working in the fields of scientific instruments, cloud computing, telecommunication, and the Internet of Things. He was former technology editor for BusinessWeek.com. Among his many accomplishments, Salkever is the co-author of “The Immigrant Exodus,” a book named to The Economist Book of the Year List in the Business Books category in 2012. Among the projects he has worked on are Node.js, Servo/Rust, Mozilla Firefox and the broad open data movement, bringing expertise in technology marketing PR/AR, product development, brand building, big data and storytelling.